One of the 19 events in the One Lap of America is circling a wet skid pad. The 2018 Dodge Durango SRT's all-wheel drive helps here. The challenge requires spending eight days on the road, covering nearly 4,000 miles and competing in 19 performance-driving events. You get only a co-driver, one set of tires and face daily drives of 500-700 miles to get to the next stop. Which vehicle would you choose for the One Lap of America? Traditional sports cars offer speed, but not a lot of elbow room. David Carr, an FCA US Vehicle Performance Dynamics engineer, and motoring journalist David Hakim think they have a better solution – a 2018 Dodge Durango SRT – America’s fastest, most powerful and most capable three-row SUV. 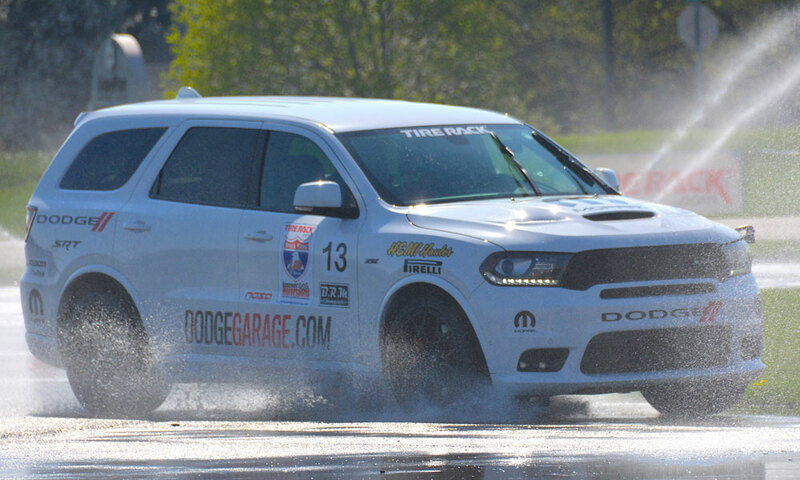 The 475-horsepower 392 HEMI® V-8, crisp-shifting TorqueFlite eight-speed automatic transmission and full-time all-wheel drive with SRT-engineered drive mode system equip the Durango SRT for a wide variety of timed track events on the One Lap program, ranging from wet and dry skid pads to private road courses to race tracks. The SRT team fitted the Durango SRT with Mopar’s performance lowering spring kit, dropping the fastest SUV in its class an average of 15 mm (0.6 inches) closer to the pavement, and bolt-in performance exhaust system, developed in concert with Dodge//SRT engineers and designers, to give the team every possible advantage. The Durango SRT’s 119.8-inch wheelbase and voluminous interior let Carr and Hakim stretch and recover during the journey to the next stop – they can even stretch out for a nap if they choose. One Lap of America participants must observe all traffic regulations while traveling between competition stops. The One Lap of America began on Saturday, May 5 near South Bend, Indiana, and concludes there on Saturday, May 12. In between, the 71 two-person teams will cross through 12 states, some of them more than once. Through Monday’s events at the Hallett Motor Racing Circuit in Oklahoma, Carr and Hakim ranked 23rd in the field of 71. 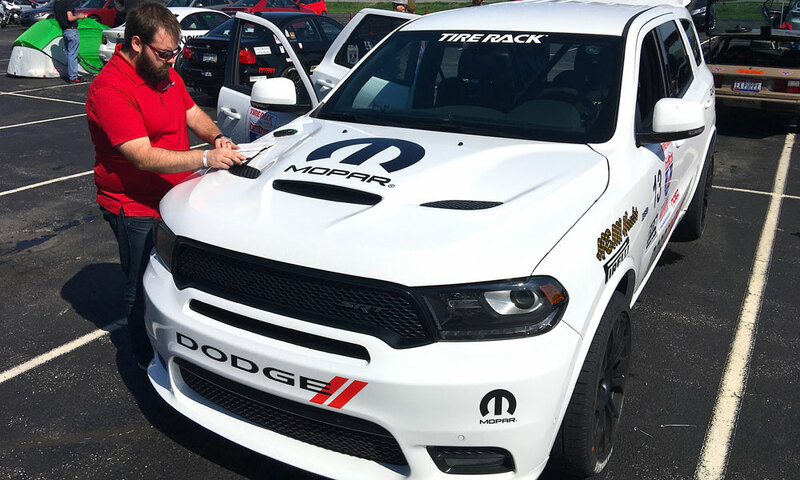 David Carr, an FCA US Vehicle Performance Dynamics engineer who helped develop the Dodge Durango SRT, is running the One Lap of America. 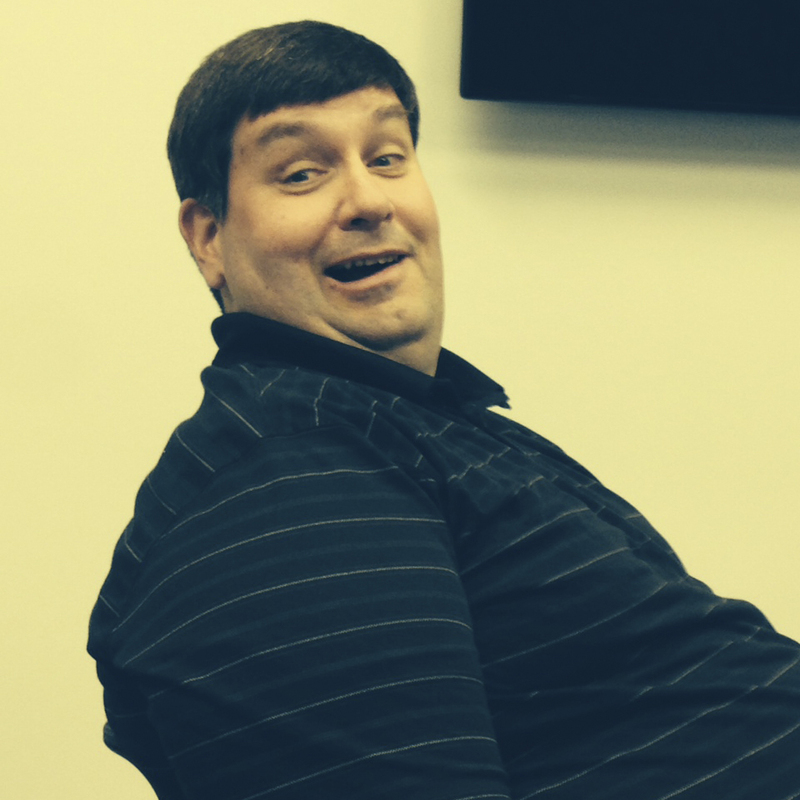 It doesn’t hurt that Carr is part of the engineering team that developed the Durango SRT. We asked what he considers the biggest challenge of the One Lap of America. Also, while Carr has an extensive racing background and plenty of time behind the wheel of the Durango SRT, he has no previous experience at any of the tracks on this year’s One Lap of America route. Follow the action with us! Look for Hakim’s reports at www.dodgegarage.com, as well as social media postings on the Dodge Twitter and Facebook pages and Mopar Twitter and Facebook pages.